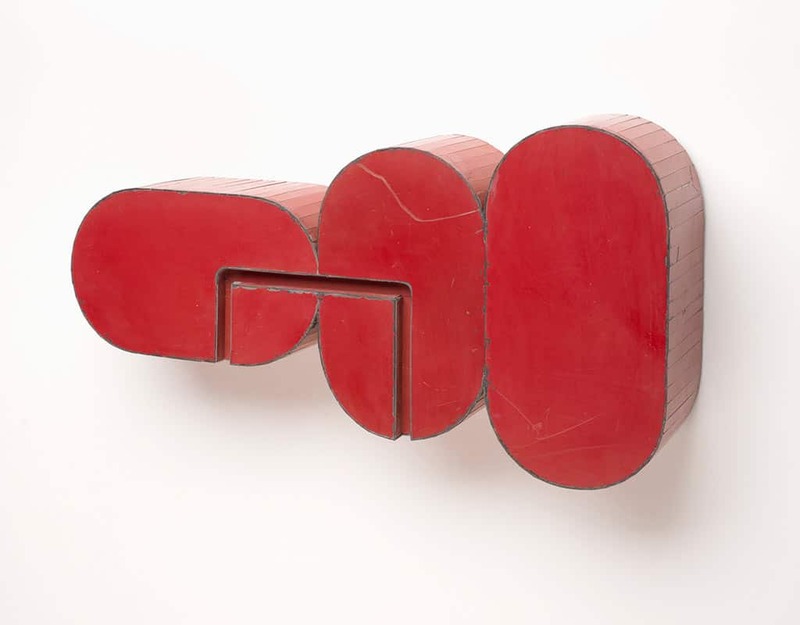 Red Licorice (2014), mixed media, including salve steel, marine-grade plywood, silicone, 18 by 10 by 5 inches. 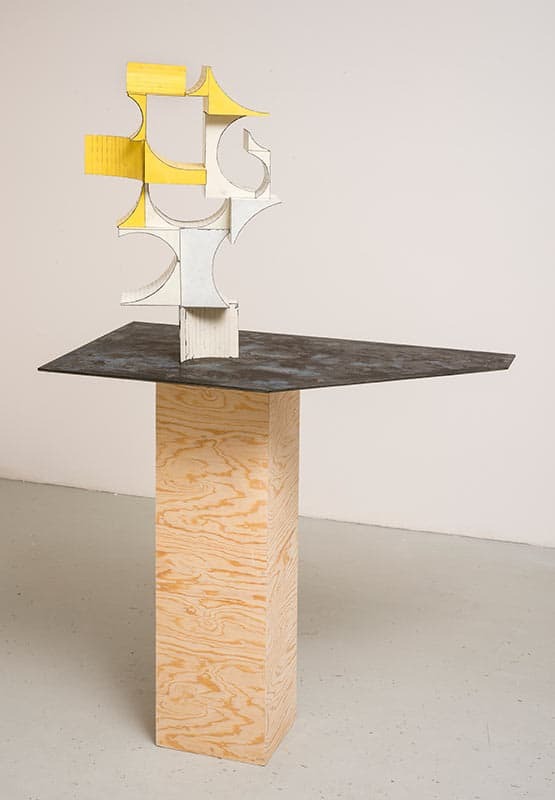 Strange Offset (2014), mixed media, including salvage steel, marine-grade plywood, vulcanized rubber, 16 by 13 by 3 inches. The strips and sheets of metal are wrapped around supports of densely compacted marine-grade plywood. 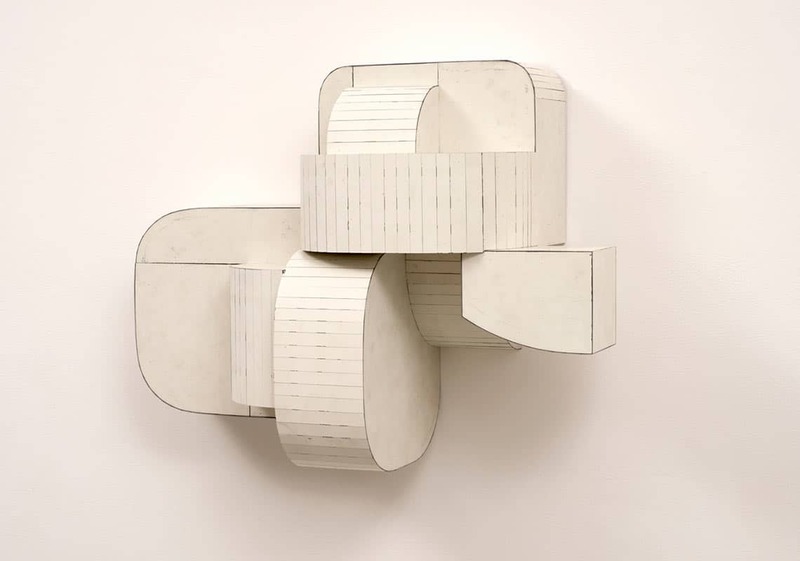 Some are open-airy structures, geometric drawings in space; others are blocky sturdy reliefs that might call to mind the shapes of biomorphic paintings of the ’50s. Of late he has been experimenting with the “wood skeletons” left after one of the relief sculptures is completed, balancing them on pedestals to find a whole new vocabulary. 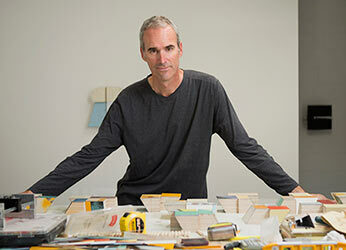 Born in 1964, Larsen is the son of two artists who moved from southwest Michigan to Santa Fe when he was six. “When I was young, because my parents were successful, I really did not want to pursue an art career. I was terrified at the idea of being compared with them,” he says. But about halfway through his undergraduate years at Whittier College in Philadelphia, he realized he “really wanted to make things.” He worked for a couple of art dealers and taught skiing before launching a career as a painter (his earlier works are now in private and public collections, but he does not include them on his website). By the age of 28 or 29, Larsen was able to support himself from sales of his work; still he doesn’t feel he arrived until around 2007-08 with pieces like Volvo, an angular construction that breathes new life into the welded metal tradition of David Smith and Julio González. Ted Larsen in his Santa Fe studio. More about the artist can be found at tedlarsen.com. Fantastic site and a great read! I’ve bookmarked the link to vasari21 and will keep checking in for more. 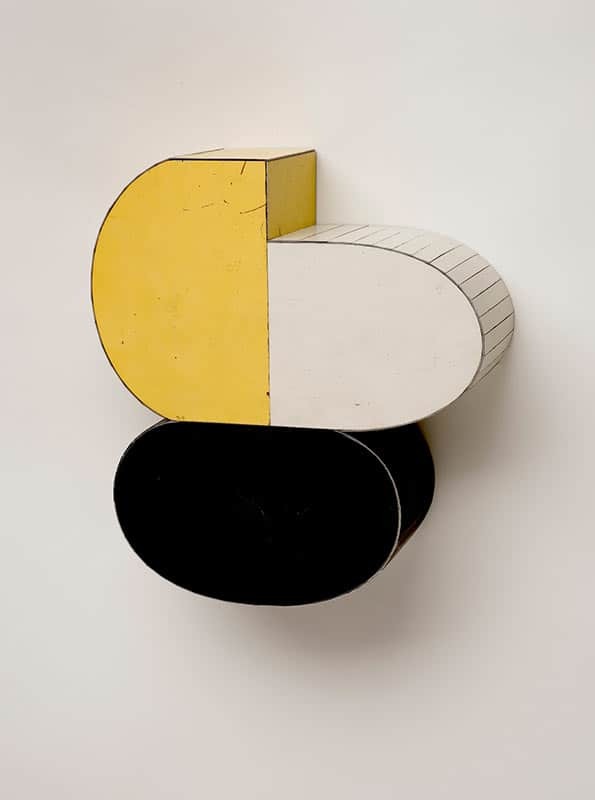 Wow, you hit another home run with Ted Larsen, since moving to Taos 20 years ago he was one of my favorite artists right away, with so much bad art out there his work stands out. As an artist I also relate to what he says about working as an artist, thinking you are there with the work and then seeing you are not there at all. Ted your work is amazing. Thank you. It’s great to see Ted Larsen’s work again. His interest in the paint of the salvaged pieces he uses in his sculptural constructions really sing when viewing the work in person. I still remember coming upon his work at Lesley Heller Workspace in New York a year and a half ago. 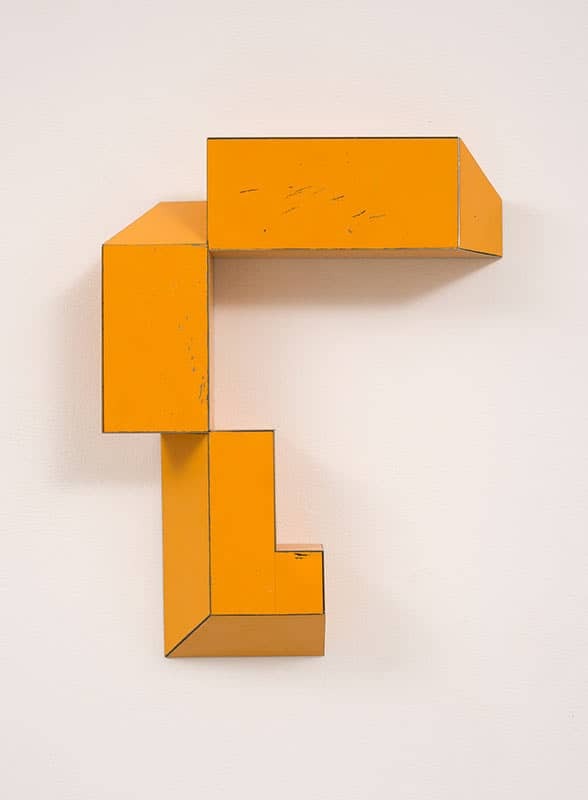 Thanks for the introduction to Ted’s work–seems like an accessible Donald Judd–making minimalism concepts tactile. Vasari 21 is a beautiful site, so many great pieces to look at and always a fun read.